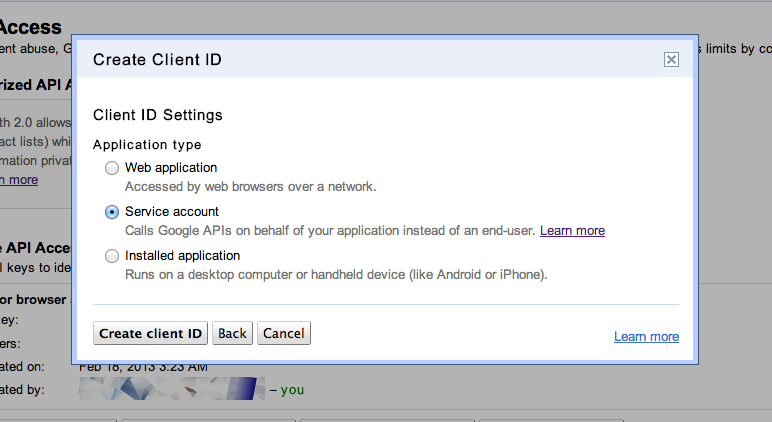 Google is currently switching their authentication systems to OAuth 2.0. BackupGoo 5 is 100% ready for OAuth 2.0, and there are some steps to setup the system. 1. Create a so called service account in the "API console"
Go to https://code.google.com/apis/console/?pli=1 and log into the console via your admin email account of your domain. This takes you to the services. 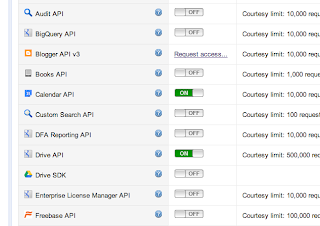 Please enable Drive API and Calendar API. 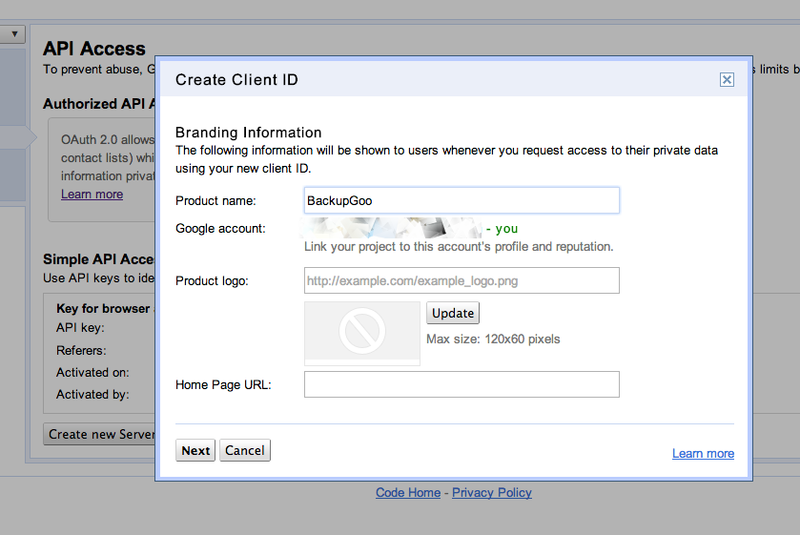 Click on API Access (left tab) and click on the blue button "Create an OAuth 2.0 client ID". 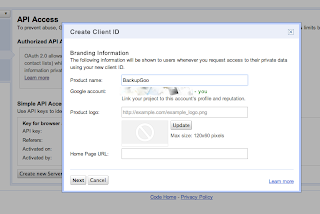 Enter "BackupGoo" (or an arbitrary name) as project name and hit "Next"
Select "Service Account" as client id setting and click "Create client ID". Then click on download private key. Keep the file in a good location. BackupGoo will need the file to access your data. 2. 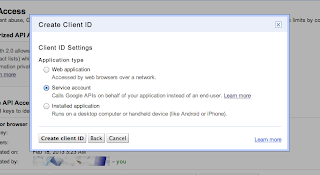 Your client ID ending in ".apps.googleusercontent.com"
3. Your Email address ending in "@developer.gserviceaccount.com"
The next step is to add your brand new API key to your domain. 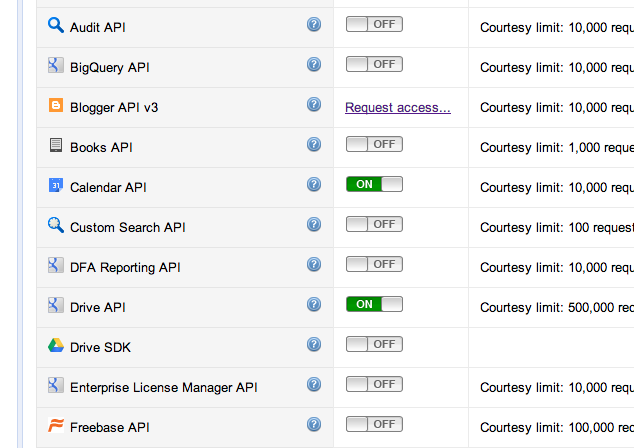 Click on "Authentication" => "Manage third party OAuth Client access". Then click on "authorize". That's it. 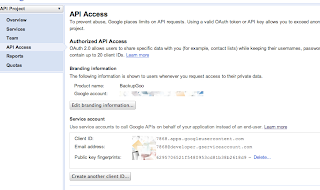 This post showed you how to create a service account on the API console and how to register that service account with your domain. 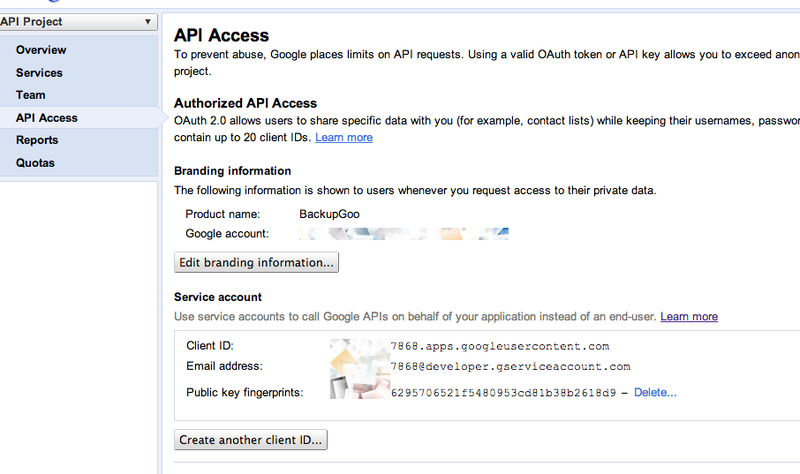 This enables you to use Google's OAuth 2.0 authentication together with BackupGoo 5. In case you got any questions - please don't hesitate to contact us at team@backupgoo.com! Ich bin eine lange Zeit für eine Lösung im Internet für dieses Problem zu finden, ist Ihr Artikel absolut voll hat mir geholfen, das Problem zu lösen. Ich kann Ihnen nur raten, auch sehr cool Programm gelöschte Dateien wiederherstellen, siehe http://www.munsoft.de. Official BackupGoo Blog. Design "Einfach". Powered by Blogger.